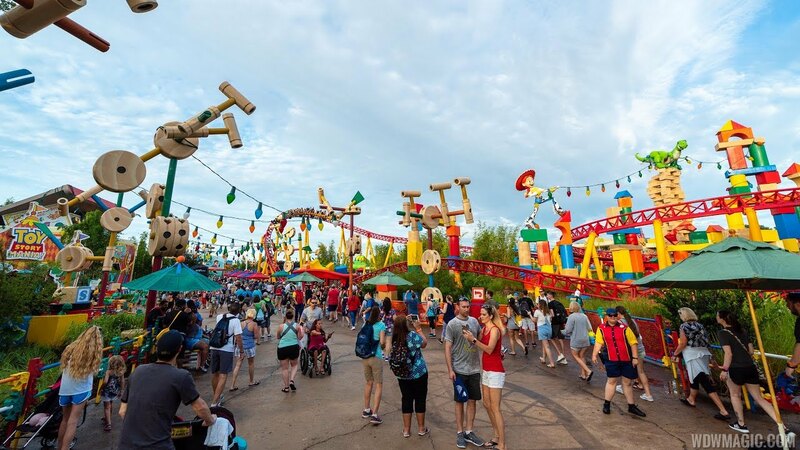 Jul 05, 2018 in "Toy Story Land"
Just under 3 years after its announcement at the 2015 D23 Expo, Toy Story Land officially welcomed its first guests this past weekend. 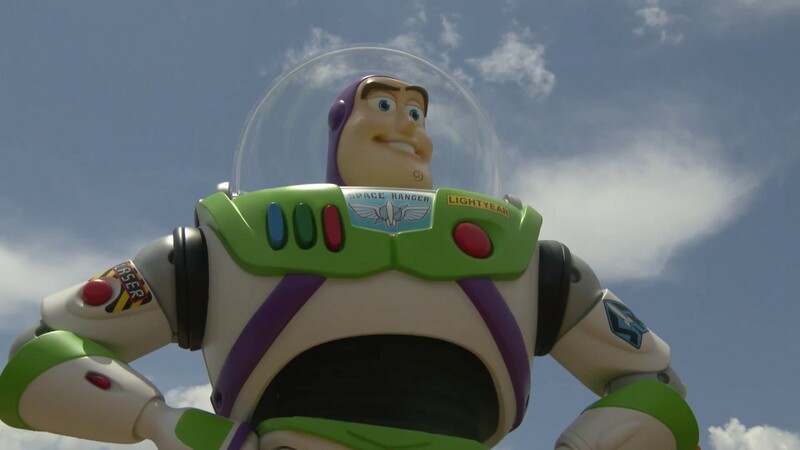 The 11 acre Toy Story Land has been built on an area that was originally part of the old Tram Tour, Creative Costuming, and backstage buildings. All part of a major redevelopment of the park, transforming it from taking guests behind-the-scenes of movies, to taking guests inside their favorite movies. Like all recent openings at Disney theme parks, Toy Story Land’s opening day was very busy with long waits to get into the land, and long waits to ride the rides once inside the new land. You can read more about the opening day experience in our report. Having visited the park on opening day, and several times since, we wanted to share with you are thoughts on the new land. It was clear from the outset that Toy Story Land was intended to provide the park with more family-centered experiences, giving the park something that families the children could enjoy together amid the park’s other more thrilling rides that cater to teens and above. In our opinion, the success of Toy Story Land has to be judged on how well it meets that need and how it benefits the park as a whole. This report contains some spoilers, so if you wish your first visit to Toy Story Land to be a complete surprise, stop reading now. You enter Toy Story Land through a wide walkway that has been carved out between the park’s original soundstages, alongside the Walt Disney Presents attraction. The premise behind Toy Story Land is that guests are “honorary toys” and are now the size of toys. So everything in Toy Story Land is big. The entrance walkway helps setup the story of being in Andy’s Backyard, with a 20ft Sherrif Woody figure marking the entry to the land. He can be seen leaning on a tall set of colorful wooden blocks, tipping his wide-brimmed hat to guests. A popular PhotoPass spot, Woody also speaks, but sadly does not move and is a static figure. There are similar figures spread through the land, including Rex, Jessie and Buzz. Turning a corner you will see almost the entirety of Toy Story Land laid out in front of you. The new entry and queue to Toy Story Mania to your left, Slinky Dog Dash to your right, and Alien Swirling Saucers straight ahead. In this area, designers have done a fantastic job of concealing site lines and making you feel fully immersed in the environment. You can’t see anything outside of the land, and everywhere you look are building blocks, Tinkertoys, Lincoln Logs and K’nex pieces. The landscaping efforts really shine and give the impression of the toys really being in a backyard alongside tall grass, weeds and plants. Something striking about all of the toys is how well Imagineering reproduced a plastic look and feel. Everything looks like it is made out of plastic. The color is vibrant and shiny, but doesn’t look painted. It just looks like pure solid plastic - right out of a child’s playroom. With the rich catalog of music available from the Toy Story movies, the background music in Toy Story land is fantastic. Everything sounds great, and the familiarity makes you feel right at home in Andy's Backyard. Moving through the land’s main walkway, sight-lines start to become a problem. Near to the entrance of Slinky Dog Dash and on higher ground, the Chinese Theater becomes visible, as does the Twilight Zone Tower of Terror. Moving towards Alien Swirling Saucers, a great deal of Star Wars Galaxy’s Edge becomes visible. It is hard to judge that particular sight-line at this moment in time, as the new Star Wars Land is still under construction, and it isn’t clear yet how the finished land will border Toy Story Land. For a land that needs to be in complete isolation to fully sell its story, the sight-line issues will be a problem for those who value such things. And it gets much worse when riding on Slinky Dog Dash, but more on that later. Take a walk-through of the entire Toy Story Land. Nearly everyone loves rollercoasters, and every time Disney adds one to their parks the fans get really excited. Disney is known for making their coasters interesting, and not following the usual pattern of just throwing down some steel track on a concrete slab. So when Slinky Dog Dash concept art was first revealed, there was relief to see that the coaster was at least embedded into the terrain below grade, and there appeared to be a lot of theming and details surround the track, albeit exposed and not enclosed inside a building. That initial relief then hit a bit of a snag in Spring 2016 with new concept art showing some rather significant changes to the land, and in particular to Slinky Dog Dash. Instead of the track carving a path through the earth, everything went above grade, and looked far more like a normal steel coaster. In that same piece of revised concept art, buildings which we believe contained an indoor meet and greet, along with a gift shop, were also removed from the project. So how did the finished Slinky Dog Dash coaster turn out after its very public revisions? For a family coaster, we think it works really well. The balance of being accessible to every age group and thrill level is perfect. Almost anyone can ride Slinky Dog Dash, with its silky smooth ride quality, relatively low speed, and a height requirement of just 38”. In terms of thrill level, we’d rank the Walt Disney World coasters like this: Barnstormer - Seven Dwarfs Mine Train - Slinky Dog Dash - Big Thunder Mountain Railroad - Space Mountain - Expedition Everest - Rock n RollerCoaster. It doesn’t go particular fast, or high, and with no loops or sudden drops it’s very family friendly. Disney, or the ride’s manufacturer Mack, have not disclosed any facts and figures on the ride, and this coaster isn’t about that. Disney usually likes to do something unique with its coasters, and Slinky Dog Dash has a couple to boast of. First, there are two launches to this coaster. Think Rock 'n' Roller Coaster, but much less intense. The first is near the beginning of the ride, and the second is at the midway point - which includes a nice pull-back feature, just like the toy. The second unique feature is the ride vehicle itself, taking the form of Slinky Dog, it even features a wagging tail. If your kids are nervous about riding, the train should help to put them at ease. Ride time is just under 2 minutes. Which is short by comparison to classics like Splash Mountain, but is fairly typical for faster moving rides like coasters. The mid-course stop for the second launch helps the ride feel longer, as does the finale featuring the animatronic Wheezy. Ride experience changes greatly depending on seating position. Riding at the front will offer a slower ride, and the back row will deliver the most thrilling ride that Slinky Dog offers. Seating is very comfortable, with each person having their own individual lap bar and storage pouch for small items. Larger items like backpacks can go on the floor. Each row seats 2 guests, and there are 9 rows giving a total of 18 guests per train. There isn’t any on-board audio, but there are some sound effects along the way, but these are more noticeable when watching the coaster rather than when riding. The queue itself is perhaps where the biggest criticism of Slinky Dog Dash will come in. Visually it looks good, very similar in style to the Toy Story Mania queue, with lots of flat artwork and a few physical props. But, unfortunately there is no indoor portion of the queue, and no air conditioning. A large section of the queue is completely outdoors in full sun or rain, and even when you move to the later part of the queue, it is only covered, and not air-conditioned. Those of you who have spent an hour or more in the Toy Story Mania queue will no doubt have appreciated that it was at least protect from rain and searing Florida temperatures and humidity. You won’t have that luxury at Slinky Dog. Making things even worse in the queue is the lack of any interactive component or anything to really look at. You can of course use the new Play Disney Parks app, but who wants to be on the phone all the time when you are on vacation with friends and family? The queue also unfortunately takes on the dreaded switchbacks configuration - with row after row of queues and railings. Finally, we have to mention sight-lines from on-board the ride itself. This is always a problem with an open air coaster, and even more so when the design switched from being largely below grade to above ground. There are parts of the ride where you can just see way to much outside of the land, destroying the illusion of being in Andy’s Backyard. There are open views of backstage warehouses, storage areas and the enormous Star Wars Galaxy’s Edge construction site. This is why Disney traditionally puts coasters inside buildings - to protect the sight-lines from the park, and from the ride. Slinky Dog Dash will no doubt be a very popular ride at Disney’s Hollywood Studios, and will likely become a must-do for most visitors to the park - and probably a first pick for FastPass+ selections. It is the ideal transition coaster for young ones ready to graduate from Barnstormer, and will become a firm favorite for adults who may not want the more thrilling experience of Expedition Everest or Rock n Roller Coaster. Be sure to take a ride at nighttime, there are some nice lighting effects, and the ride feels different and slightly more thrilling in lower light. This is one of those rides that people will either love or hate. It is short, repetitive, and very similar to the kind of ride you will find at a fairground. Yes it is dressed up with little green aliens, elaborate lighting and great music from the movies, but it doesn’t change the fact it is still a very basic spinning whip ride. The Claw from the movie hangs over the ride vehicles, but in what seems like a missed opportunity, it doesn’t move or play any part in the ride. If you like to spin around in circles for 85 seconds, this might just be for you. Kids are likely to be more impressed, especially at nighttime when the lighting effects are visible. Like Slinky Dog Dash, it is all outside, although mostly under cover. It will close during bad weather, and initial waits have been lengthy, upwards of an hour. Height requirement is 32", FastPass+ is available, and seating is 2 to 3 guests per seat with a total of 22 vehicles (11 in each of 2 ride systems). Sadly dining in Toy Story Land appears to have not been a priority, and there is only a walk-up window with limited outdoor seating. The food is slightly more interesting, with a collection of classic American sandwiches on offer. Since opening, Woody’s Lunch Box has been packed with people looking for a bite to eat, with lengthy lines at the window, and every seat taken. The chances are if you eat here, you will not get a seat. And be prepared to wait a long time to order. Mobile Order via My Disney Experience app is on offer, so that will likely be your best option. We’ll have a more detailed review of the food later - so keep a look out, but for now, check out the pre-opening report of Woody's Lunch Box for a look at what is on offer. Like the food, merchandise surprisingly is relegated to just two small kiosks - a toy camper and a toy dump truck. The primary merchandise store for Toy Story Land is strangely located on Sunset Blvd, in the recently redesign Beverly Sunset (the old location for Sweet Spells). You can see some of what is on offer from our pre-opening preview of the Toy Story Land merchandise. 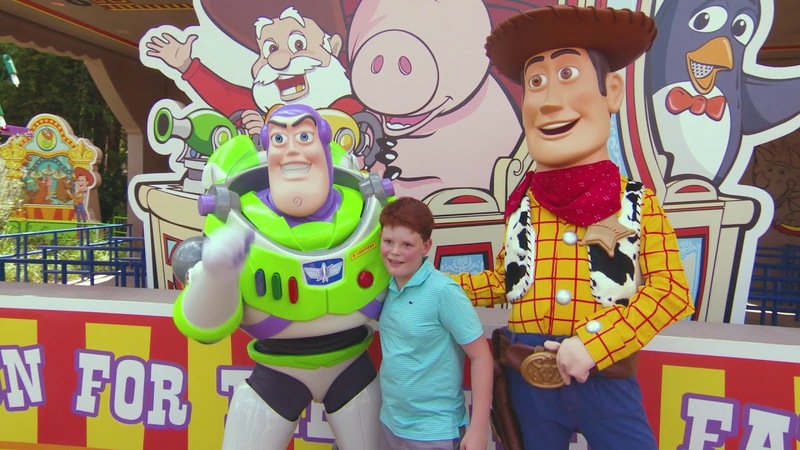 Toy Story Land does not feature an indoor meet and greet like it predecessor in Pixar Place, but Woody, Buzz and Jessie do appear in Toy Story Land for meet and greets. Their location isn’t fixed yet, but expect to see them near to the land’s entrance area. The Green Army Men also appear playing games with guests, and also keep a look out for the Green Army Drum Corps roaming through the land. The opening of Toy Story Land will ultimately see the closing of Pixar Place, and so the entrance to Toy Story Mania has moved into Toy Story Land. The queue is larger, and sees the welcome return of the interactive Mr Potato Head into the queue. No changes have been made to the ride, which left us feeling that an opportunity was perhaps missed to relaunch the ride with a new set of games to play. Toy Story Land adds two badly-needed family rides to a park just at the beginning of a major overhaul. Slinky Dog Dash is likely to become a family favorite and for many people a must-do on their visit to Disney’s Hollywood Studios. Alien Swirling Saucers will no doubt have its fans, but for many it will be a ride once and done. Toy Story Mania also sees a gain with a better queue experience, and potentially shorter wait times with more now on offer in the park. Perhaps the most criticism for Toy Story Land will come from the things that are missing, made even more puzzling by the fact that this land is aimed at families with young children. The only indoor space is the restroom and Toy Story Mania, with everything else either fully exposed to the weather, or at best under a cover. Anyone with young children knows how being in direct sun and heat quickly becomes a problem, and throw in the typically afternoon thunderstorm and Toy Story Land rapidly becomes an unfriendly place to be. Eating at Woody’s Lunch Box will see you enduring a lengthy queue at the window and scrambling for a table, and even then your only option is outdoor seating. Meet and greets will see you queuing again outside in whatever weather Florida throws at you. Those same afternoon storms will close two of the land’s three attractions, and your only option to seek cover will be to leave the land or enter the Toy Story Mania standby line. There isn’t even a Disney-standard indoor gift shop in the land to retreat to. It may well be that your opinion of Toy Story Land will be formed by the time of day and year that you visit. Given low crowds, dry and cool weather - you’ll love it. Head there on a crowded hot summer day, with storms in the mix, and it may be a very different story. It may be argued that every Disney park has this kind of land. DinoLand U.S.A. at Disney’s Animal Kingdom, or Storybook Circus at the Magic Kingdom. They all have their shortcomings, but still add something to the park. And this is true with Toy Story Land, yet we cant help but wonder what could have been. If you look at Cars Land on the West Coast, you’ll see how immersion into a Pixar movie can really be done. We think Toy Story deserves that same level of immersion and depth. But those of you who may come away a little disappointed, hold on for 2019, which will see the opening of what is expected to be Disney’s most impressive land ever - Star Wars Galaxy’s Edge. View more videos from Toy Story Land. View more photos from Toy Story Land. All the Toy Story Land news.